Back again with Atlantis and today we see the team seemingly return to Earth and the team find a seemingly derelict wreck. If you’re wondering about the odd episode numbering I’ve moved to do The Defiant One now and then do The Storm two parter next week rather than split it up. On a mist covered world in the Pegasus Galaxy the team have made a startling discovery. It turns out that while the world may seem empty the mist itself contains large amounts of energy, allowing them to possibly dial all the way to Earth. The team get Weir’s backing to take the Atlantis control crystal (which allows the dialling of the eighth chevron to allow extra-galactic connections) to the planet to at least allow them to communicate with the SGC if there’s no way to guarantee a return trip. Rodney is able to successfully interface the control crystal allowing communication with the SGC, who ask that a small group consisting of FART and Weir come through to update them and that they can get back anyway due to Asgard upgrades to the Prometheus. On Earth the group are greeted by General Hammond who immediately debriefs them in the briefing room. While Weir talks up the wonders of the Pegasus Galaxy Hammond informs them that the Wraith are a bigger threat than the Goa’uld and that the Pentagon are suggesting they scrub the Expedition now to avoid the Wraith being a threat to Earth. Weir however pushes to keep the mission as they are responsible now for what happens to the humans in Pegasus given they woke up the Wraith. After the concluding of their debriefing the various team members all decide to take some R&R on Earth, though Sheppard thinks something is off, only to find their happiness short-lived however when it’s announced the Prometheus upgrades have gone wrong. As the members of the team try to come to grips with being stuck back on Earth (how terrible) Sheppard takes Teyla to his luxury bachelor pad where everything seems to be perfect. As the two begin talking about Earth and friend’s Sheppard hasn’t seen for a while two of his old squadmates turn up to his shock before a house party takes place. Just after Ford turns up out the blue with pizza Sheppard shocks the room by announcing that his two friends had died during a mission years before. Meanwhile at the SGC Weir is informed that her role as leader has been “reassessed” as the information about the Wraith has convinced the SGC that it should be a “Military-first” mission. It also becomes clear that in Weir’s line of events Sheppard is still on Atlantis and the opposite is true for his view of events and despite that Weir and Rodney keep talking to each other their personalities seem to be widely different. Around the same time all the members of the team realise their realities are all fake and that something else is holding them hostage. Weir is the first to be told the truth, with it being revealed that “Hammond” is in fact a mist creature and that the mist on the planet were all living beings. The real versions of the team are all brought together in the SGC gateroom by the creature, informing them that the team never stepped through the Gate to Earth and are only unconscious on the planet. It turns out that the mist people are killed whenever the Gate is dialled. While he at first allows them to inhabit a reality of their choosing together he doesn’t seem to understand their need for food and water to continue living. Instead the team convince him that if they allow them to leave the planet via the Gate back to Atlantis they’ll shut down the Gate and never return which the creature agrees to. So here we have Atlantis joining another cliché of the sci-fi, and even just general TV, genre. The “they don’t know it’s a dream” episode. Despite the cliché beginnings however the writers once again use it to great effect. The story starts with the team seemingly heading back to Earth after they find a planet with immense power for the Stargate. After arriving however almost immediately small things start occurring that make everything seem odd at the SGC. These include items like Hammond being back (and the wrong rank), people being really happy to see them, and all their subconscious desires seeming to happen. Later this moves to people being in two places at once and going through sudden personality shifts before the final reveal that it’s all fake. It’s the almost hidden way in which the episode slowly unravels the premise that makes it so fun to watch, with things to look for whether you’re a new fan or long time viewer of the show. Some of the smaller aspects, like Hammond randomly showing up at the SGC almost immediately, seem to be more hints that something is up for those who have been with SG1 from the get go while many of the later revelations, such as the final hit that Sheppard’s long dead mates have shown up, can be enjoyed by everyone equally. The tearing apart of the scenario from the character’s perspective also feels well done, with each of the character’s slowly noticing how odd things are with Sheppard noticing how everything is too perfect, Weir seeing previously friendly military officers becoming hostile, Rodney finding all the science makes no sense, and Ford is… around I guess(?). Outside of this the idea of a mist entity that defends itself by doing nothing or then rendering threats unconscious is an interesting one. For the first Act of the episode they don’t even interact with the team at all, preferring just to suffer small losses as opposed to making their presence known. It’s only when millions of their people are threatened that they then render the team unconscious not only to prevent them dialling the Gate but to also understand their intent. It’s this willingness to learn that makes the diplomatic ending a nice change on both shows (who recently have seen violence become the solution to everything) with the mist creatures and Expedition deciding to simply trust each rather than think ill of each other for behaving as they did up to that point. Overall the episode, while still serious in nature, is a lot slower paced and more relaxed, largely looking at how quickly the team has been changed by their experiences in the Pegasus Galaxy. 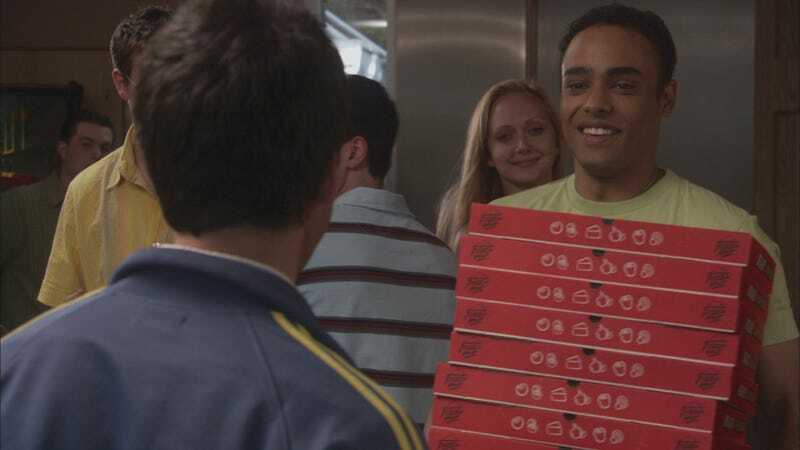 Also Ford delivers some pizza which is his most useful act so far. · Rodney’s inability to understand he’s not well-liked is kind of tragic. · Rodney randomly suggesting to backstab the mist at the end? Why? Sheppard and Rodney are flying in the Jumper with a couple of other scientists, Gall and Abrams, to fly to an Ancient defence satellite discovered in the Lantean system where Atlantis resides. When they reach the satellite however they also discover a Wraith distress beacon emanating from a nearby desert planet which they decide to check out to at least shut down. Despite arguments from Weir about not going, with the 15 hour flight time being their first concern, the team go anyway. Upon landing they find a lifeform much like the glowing bugs that were found by SG-1 in Prodigy that is attracted to life forms. After walking past the lone bug they find the crashed ancient Wraith ship seemingly abandoned and long dead. The team decides to split up (because that’s always a good idea) inside the ship with Gall and Abrams doing a body count while Sheppard and Rodney look for the source of the distress signal. On the way Rodney decides to bring up the idea that a Wraith could’ve survived the thousands of years the ship’s been crashed there, causing Sheppard to call a retreat. Before they can exit however a Wraith feeds off of Abrams until he dies and heavily feeds off of Gall. By the time Rodney and Sheppard reach the others Gall is already an old man, with the Wraith escaping to the desert in an attempt to make its way off the planet. While Rodney stays with Gall Sheppard gives chase, finding that the Wraith has captured the Jumper but can’t use it. Sheppard advances on the Wraith and seemingly takes it down with his P90, only for it to grab an M9 in the Jumper and wounding him in the arm with it. Sheppard manages to fall back but finds his P90 is damaged as well, leaving him heavily outgunned, almost blowing himself up later when he finds out that some orbs he picked up are Ancient hand grenades. Knowing that Sheppard isn’t doing so well alone against the Wraith Rodney wants to go out and help him but states Gall can’t be left alone. Gall however tries to encourage him to leave him, knowing he’s done for, but Rodney refuses to budge. Eventually Gall decides to release himself as a burden on Rodney, killing himself with his M9. Just when things look their bleakest for Sheppard however, with his ambush failing to stop the Wraith, the backup Jumper sent by Weir with the rest of FART inside arrives but can’t get a lock on the Wraith as a target for their weapons. Sheppard however uses an energy bar to lure in some of the flying bugs from earlier and sticks it to the Wraith, creating an obvious heat source for the Jumper to target, blowing up the Wraith. The Defiant One is an episode I just straight up don’t really like and is probably my least favourite of the first season of Atlantis. The story follows the team as they explore a desert planet holding a crashed Wraith ship, in the process waking up its one survivor. After a long fight the team, with much needed backup from Atlantis are able to bring it down. For such a simple premise the first problem is an unexpected one, the episode feels too damn long. It’s slow and plods along with many scenes simply there to fill out the airtime. I can understand the wanting to lengthen the fight between the Wraith and Sheppard but rather than feeling tense it just feels dull, with scenes of Sheppard using binocs featuring too often. By the end you’re honestly happy Ford has shown up and that’s not something fans of the show want to say. Outside of this the other main problem is that this episode is just way too dark for the show. The franchise has seen some darker events featured but never before has it been so blatant, with Gall taking his own life right in front of the camera and Rodney’s horrified reaction plain as day. For a show that was built on being relatively light and fun this feels like a serious misstep and born out of a poorly planned feeling of needing to be more serious. Maybe this is where the idea of Stargate Universe was born as that suffered similarly from super-serious disorder. Apart from those two things there’s not really much to say about the episode to be honest. It’s boring, way too long, and overly serious to the point it’s hard to tell what show it is anymore. Definitely not one of the show’s finest moments. · That was a short 15 hours on the planet.